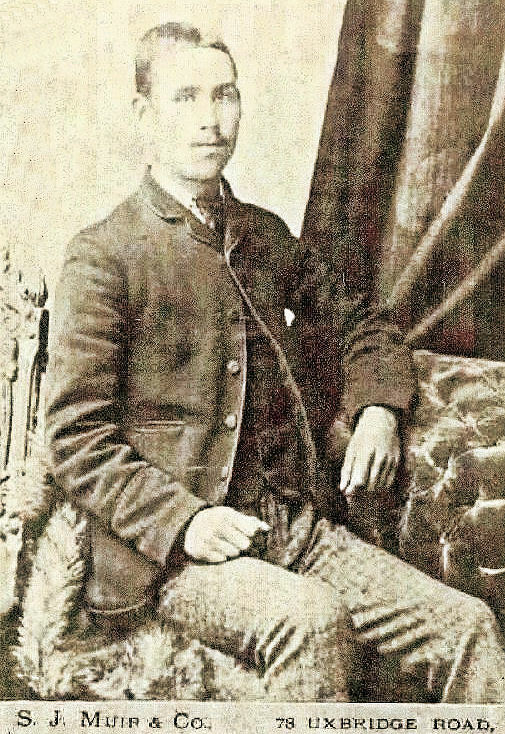 Charles Edwin Gurnett was born in 1871 at Swanbourne. He was the fifth of eight children of William and Charlotte Gurnett and they lived in Nearton End, where they attended the Primitive Methodist Chapel. Charles worked as an agricultural labourer and then got a job as under gardener at Swanbourne House working for the Fremantle family. At the age of 25, he became engaged to his girl-friend Elizabeth Massey and the wedding was planned for June 1897. Banns were read at St Swithun’s Church in Swanbourne on Sundays 23rd and 30th May but then she is said to have called the wedding off. Charles Gurnett was heart-broken and in a moment of deep depression attempted to commit suicide by taking weed-killer. He did not return home and was missing on Thursday morning. A search party went to look for him and his brother William Gurnett found him kneeling in pain in a shrubbery. 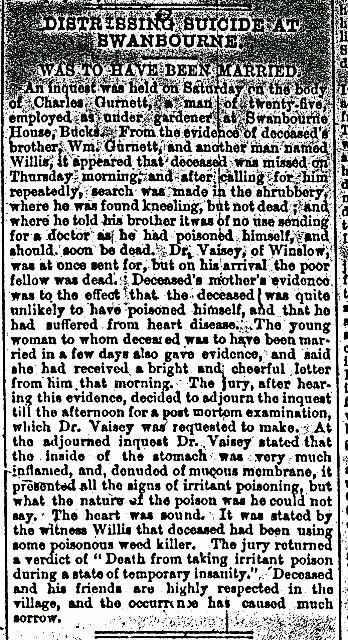 He told his brother that there was no use calling the doctor since he would be dead soon. 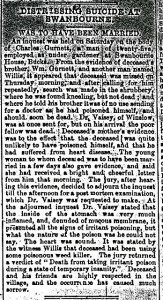 Dr Vaisey of Winslow was sent for, but by the time he arrived Charles Gurnett had died. Charles’s mother, Charlotte Gurnett, refused to believe that he had committed suicide and preferred to believe that he had suffered from heart disease. He was buried on 9th June 1897 in Swanbourne Cemetery. The grave is unmarked.